How to choose Kitchen Tableware? Decide if you are looking for casual or formal dinnerware. Casual dinnerware is sturdy and designed for everyday use. Formal dinnerware is usually more delicate, made for holidays and entertaining. Define what other uses your dinnerware will have. For example, if you want to use it for outdoor use, you may want to look into less common but unbreakable materials, such as metal or laminate. If you will only use a formal set during the holidays, you may want to coordinate the colors for Christmas. Evaluate your current dinnerware. 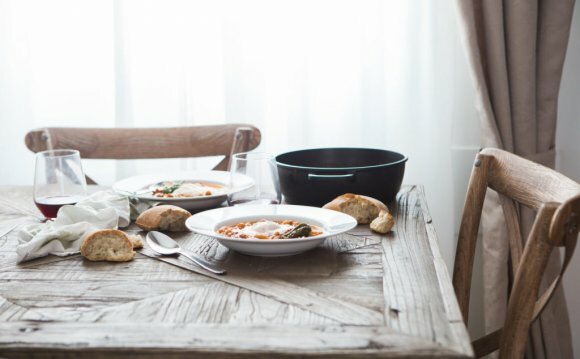 Is it important that your new dinnerware matches your old material. If so, you will need to coordinate by material, color or pattern. Choose your material. Dinnerware is commonly made with bone china, porcelain, stoneware, semi-porcelain, ironstone, cream ware, majolica and faience. Casual dinnerware should be made with a sturdy, dishwasher-safe and microwaveable material. It is most often made of stoneware or earthenware, such as cream ware, majolica, faience, and delft. These materials are less sturdy than bone china or porcelain, but they are inexpensive and easier to replace. Formal dinnerware is often made of bone china and porcelain. Porcelain is the hardest ceramic and is referred to as "white gold." Bone china is strong because it is fortified by ox-bone ash. Both types are expensive, and neither is ideal for dishwasher or microwave use, because they are harder to replace. Choose your color scheme. Plain white dinnerware is still very popular, because it is dishwasher safe, it doesn't fade, it is easy to replace, it matches most decor and it showcases food well. However, you can also coordinate with your dining room or kitchen by picking a color. If you have a brightly colored dining room, neutral colors will compliment it well. If you have neutral colored décor, you can incorporate a bright color into your dishes that will bring out other aesthetic accents. Decide if you want to incorporate patterns into your dishware. A general guideline is to include a plain part of dinnerware with your patterns, so that they are not overwhelming. Many patterns are created with decals or transfers and should be hand washed to prevent fading or removal. Gold or metal lined patterns should not be used in the microwave. Choose shape and texture. A way to spice up a plain dishware collection is to buy complimentary bowls or plates in a different shape or texture. Both plates and bowls are made in ovals, squares and more. Consider mixing and matching your set. Many people are stepping away from having plates, bowls and silverware with the same patterns or colors. You can mix and match different colors, patterns, textures and shapes. Decide how many settings you need. A good rule is to buy as many sets as people you can imagine hosting comfortably for dinner. If you are on a budget, buy enough for the family and add to your collection later. Welcome to Temporary Kitchens, the leading company providing its clients with temporary and emergency kitchen. The company's specialization includes renting and manufacturing temporary kitchen solutions. The experienced team is always ready to realize the needs of their clients. They try to adapt the solutions they have to customers' demands. Their services are various and not too expensive. Well, if you need a temporary kitchen rental, don't hesitate to contact with Temporary Kitchens. You surely won't be disappointed.